This is what one of my lovely clients told me when we began a redesign of her home. 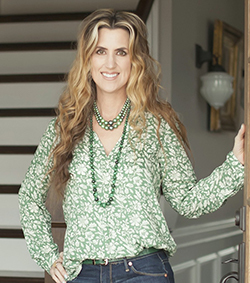 Her family lives in a lovely period home, full of historic charm. Unfortunately, space on the main level is limited, and we could hardly get her baby grand piano up the stairs! 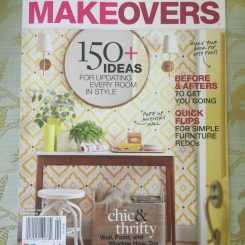 An important part of my job as a Nashville interior decorator is finding solutions, and sometimes those solutions may be a bit outside the box. It was obvious that the dining room was currently being used as a holding area for things to go to their storage unit or Goodwill. 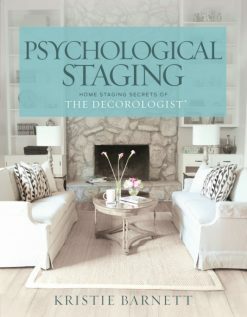 When I asked my client how often they use this room for actual eating, she said maybe – maybe – once a year. This is an underutilized room that could potentially be the music room she was wanting. There is already seating for seven in the kitchen for this family of four, which is where they typically eat their meals. And when they entertain? It’s usually a finger food event, where people serve themselves from the kitchen island and sit on the more comfortable upholstered seating in neighboring rooms. No dining table required, really. So it was decided. 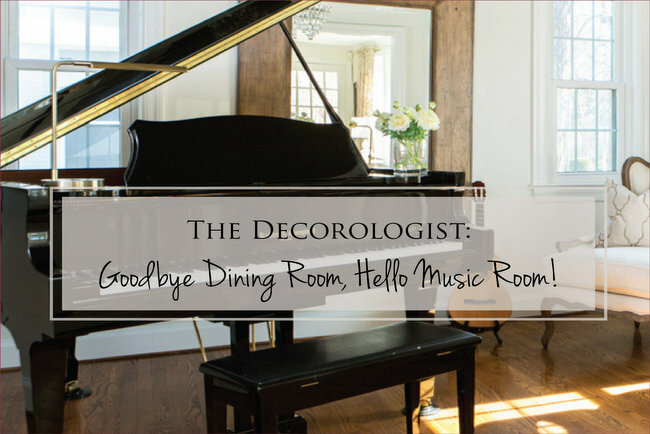 Out with the dining room, in with the music room! We already had the instruments, which included a gorgeous baby grand piano and a guitar. I came up with a plan for a new paint color palette, window treatments, and just the right seating for the musician’s audience. 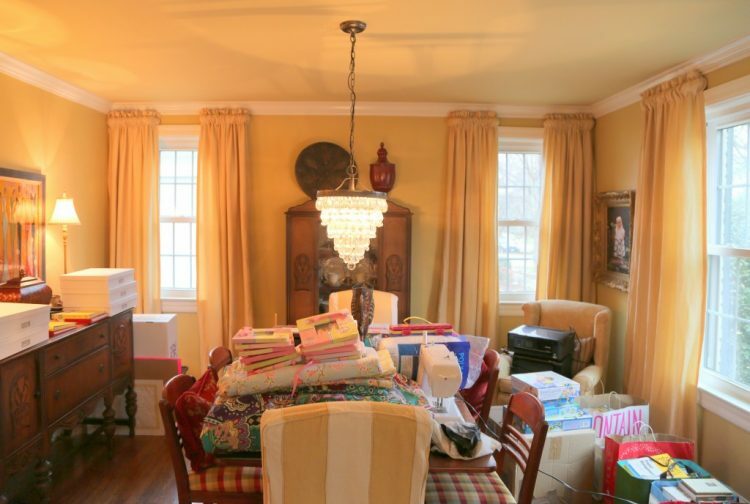 My client was SO OVER the previous golden yellow wall color that in this room for years. 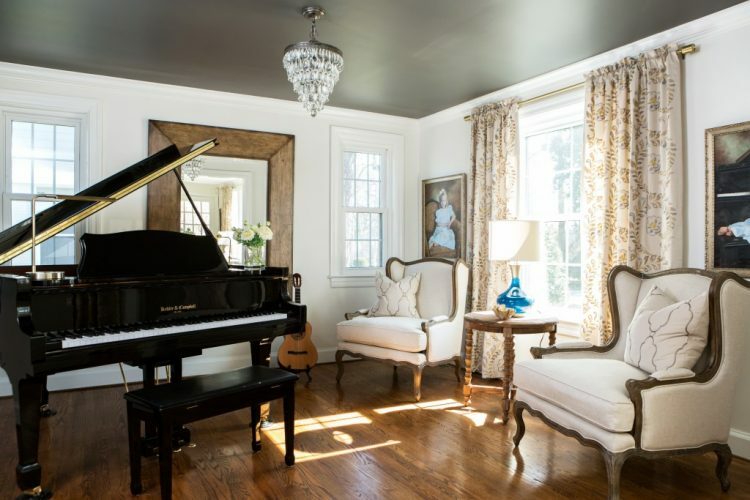 The walls and trim were painted the same white, while the ceiling got an extra special treatment of Benjamin Moore Kendall Charcoal HC-166 in a satin finish. Don’t you just love how the light bounces off of it? Below is a shot of the room facing into the adjoining living room in its before state. You’ll notice that the piano was previously taking up a large portion of space in the living room. In this after photo, you get to see a bit of the transformation in the adjoining living room, as well. I’ll show you more of that another day. Notice that we did new draperies in both rooms, which face the front of the house. I decided against curtains on the smaller windows on the side of the house. There isn’t a privacy issue there, and the room would have looked much smaller had we put curtains on that end wall. The blue lamp is really pretty – although it looks peacock blue when the light streams in, it’s nearly navy when the sun isn’t shining on it. I only have a photo of it when the room was sunny, but it is beautiful both ways! Would you ever give up your dining room to make it into a music room, a library, an office, or something else more functional for your family? 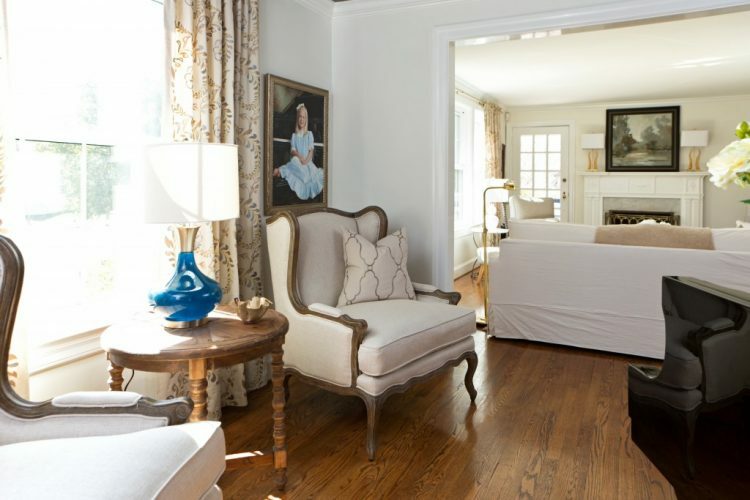 This entry was posted in Color Consultation, Design Intervention and tagged decorologist, design, dining room, hc166, kendall charcoal, music room, nashville. Wow! I love that room! Probably one of my favorite transformations you’ve shown on the blog. SO pretty. Because of the ages of my boys and the way our home is constructed, our “formal” living room is currently the playroom. In a few years, it will be our music room! 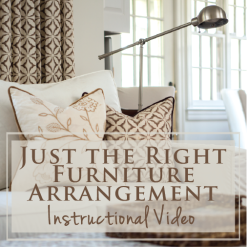 I can’t justify filling a room with furniture and then telling everyone not to go in there (like was the case when I grew up – sorry, Mama!). So ,we’ll keep the piano in there and move my husband’s guitars downstairs and add to the collection of instruments. 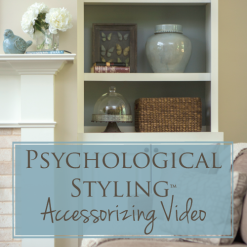 Yes – rooms have to be functional, in my opinion. When they are functional and lovely, all the better! Gorgeous! The charcoal ceiling is absolutely stunning! We also turned our dining room into a music room, but without a baby grand ours is no where near as impressive 😉 What an amazing transformation! It is beautiful. The rooms look so much bigger and brighter. It does look bigger, doesn’t it? People are often scared of a dark ceiling – that it will make the room appear smaller. I find the opposite is true, especially when you keep the walls light and neutral! So beautiful! I love how it turned out! It’s perfect ! I do love the dark paint on the ceiling. Wow what a transformation ! You did a great job Kristie ! What an elegant transformation! Love the lighter neutral tones in this home; it all ties together so well. That is my plan for our retirement home when we can move there. The dining room has a bay window & a baby grand would look…well, grand! I hadn’t decided on the seating yet, though, so I love what you did there. Gorgeous job, Kristie! I see the ceiling color- but what white ate the walls and trim? The walls and trim are Ben Moore’s White Dove. I made a dining room into an art studio in a previous home. 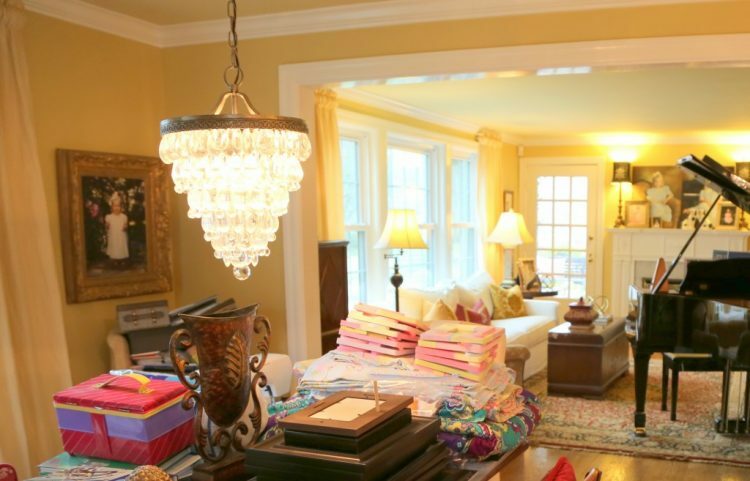 When we built a home I left out a dining room and included a full-fledged art room. 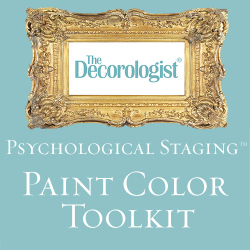 Love that – I had a client who was a landscape artist, and he turned his front parlor into an art studio. It was a very inspiring space! I turned my dining room into a bar – best move ever! Love your music room ? I remember seeing when you did that, Donna! I bet everyone wants to hang out at your house now, haha! This is beautiful! What great ideas here! Thank you! We recently turned our living room into our dining room. The former dining room is now our sitting/music room with the piano, some side chairs and our dry bar. 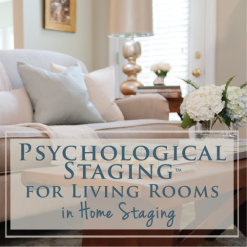 I love to switch up dining rooms and living rooms – for people who host large gatherings, the larger living room is better as a living room, and the usually smaller dining room is a perfect “away” spot for reading or hanging out with just a couple of people. Beautiful, simple, and elegant. What absolutely stunning work you did to create this very special room. Thank you so much for the complement, Jane! Simply stunning!!!!!! No other words need to be said!!!! Thank you Kristie!!!! This is gorgeous! My favorite of your many great transformations! This is beautiful! This is my favourite transformation you have done as well. I am moving into a new home in June and am looking for ideas, this one is a keeper! Can you tell me if the colour of the walls is the same as the trim? Also, do you have any information about the gorgeous mirror? Is it wood or gold? Thank-you for sharing! Glad you like it! Color on walls is White Dove in eggshell finish, and color on trim is White Dove in semigloss finish. Same color, different finish. The shinier trim will read a bit lighter than the wall due to light reflection. The mirror is to-the-trade only. It is painted out in wood tones with gold highlights. I love the transformation! But then again, I love everything you do. You have inspired me to consider painting my bedroom double tray ceiling in this lovely color and finish. I get stuck on the double tray and what color it should be. Only paint the flat uppermost part of your tray this color – the lower tray and vertical wall bits should be trim color in the same finish as existing trim. 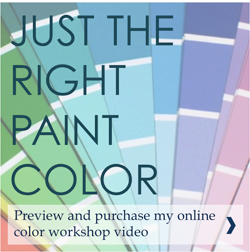 This is the most updated way to paint out a tray ceiling! Love the transformation!! Much easier on the eyes than the yellow tones of before. 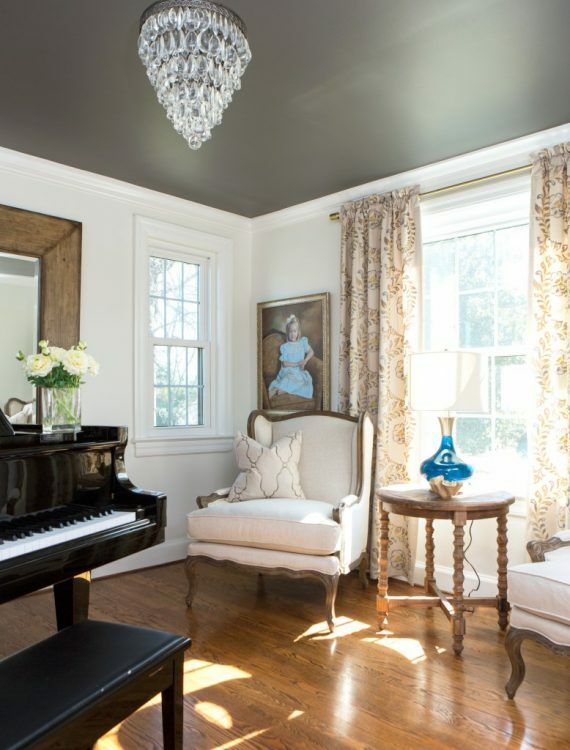 As for using Kendall Charcoal for the ceiling, would it still be as lovely using a flat finish instead of satin? I would like to have this look in our living room but we have a pitched ceiling with two skylights and maybe not such a perfectly smooth surface. Yes, Jeannie. It would be fine in flat! How absolutely stunning – clients must be over the moon happy. 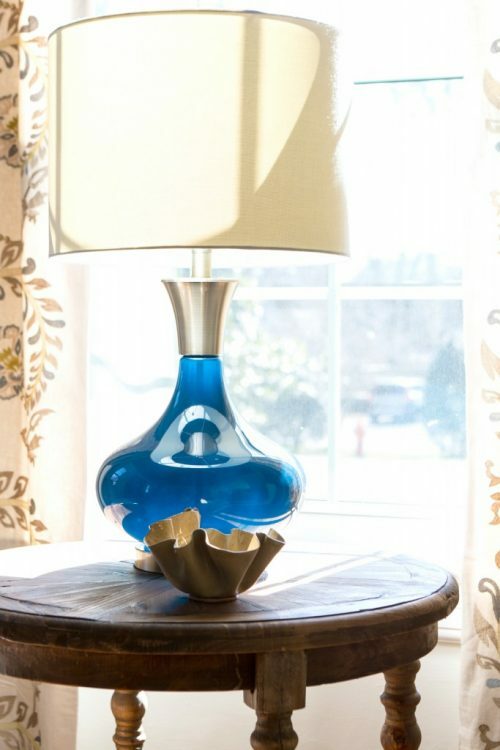 I especially love your trademark painted ceilings – and the lamp is to die for!!!! This is absolutely gorgeous! I love everything about it. In our house, we turned our dining room into our home office. For us, a dining room is wasted space for 99.9 percent of the year, so it was a no brainer to do this. Yes, that makes good sense, Pam! What a great transformation! Really looks so spacious and beautiful. I loved how you choose the lmap to go with the dress in the picture. Details! Great job! This is definitely my favorite make over to date! Beautiful!! One question if you don’t mind: will the client manually close the curtains for privacy? I just put up beautiful curtains and I’m worried that over time my hands are going to stain the fabric if I am yanking them open and closed every day? She would have to close them manually, Michelle. The good news is that she rarely closes those curtains! There’s little need for her to, since it isn’t a room that requires privacy (like a bedroom). Hi Kristie, Do you recommend a minimum ceiling height when painting a ceiling a dark colour? Also, are these curtains to the trade only? So very lovely! But one question, when the piano is being played wouldn’t it make sense to have the sofa on the window wall as it was previously? The sofa makes the music room private, maybe that was the reason… But I do love this room. I the lamp to the trade? I didn’t see any info on the lamp. We tried different positions for the sofa, and the homeowner liked how it separated the two rooms/areas. Also, the sofa had been in the same position beneath the windows for many years, and she simply wanted a change. Good question! Also, the lamp was from HomeGoods! 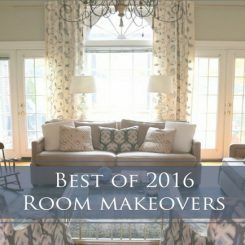 I think this is my favorites of the rooms you have done! So classy, so elegant, so gorgeous!!! I LOVE it! Aww, thank you so much, Melissa! This room is simply gorgeous and fantastic. My favorite of your work so far! Thank you for sharing! We had a large formal living room and a small dining room. The living room was never used, the dining room at holidays but with our growing family (grandkids) we were running out of room. We switched the 2; the larger room is now the dining room and can accommodate the table with 2 leafs. And instead of a formal living room the smaller room is now my office complete with a sofa . . . where I work all the time. Sounds perfect! I will often suggest switching the formal living room and dining room when it makes sense. Such a simple thing can make a huge difference in regards to function for a family. Thanks for sharing, Lori!!! Wonderful room! And that ceiling with the satin finish paint looks amazing! I think the charcoal color works especially well with the piano being a large dark object in the room. Without that element, would you choose a different color? Not necessarily, but it does look particularly beautiful with the piano! Without the piano, I’d be sure to repeat the dark with a few black items in the room. A www, you are so sweet, Jessica!! !